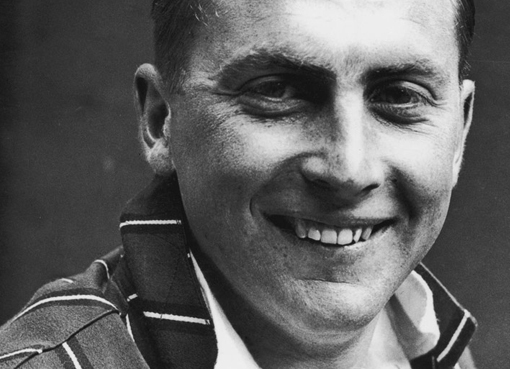 The death of Peter Roebuck has brought the name of Harold Gimblett to the fore, with many eulogies linking the manner of the deaths of these two Somerset cricketers. Though well intended, the link is frail. If Roebuck contemplated suicide it was in the same way that Dostoevsky might have contemplated it, that is, as an exercise of hyper-rationalism, as part of the same process that made him the kind of writer he was, seeing and relishing drama where others didn’t, finding things humorous which others didn’t. Peter will have first come across Harold – the focus of this piece – when, as a thirteen year old, he took a chit for an article of clothing to the school shop, housed in a Nissan hit midway between the coach park and the drive leading to Millfield House. Inside was warm and cosy. A counter ran across its width behind which sat a small slightly rounded man in his mid-fifties wearing a cardigan and slippers, and carefully completing one of those paintings-by-numbers, or perhaps sowing, the silk following a traced pattern on the cloth. The borders were to be kept and lines followed clearly and precisely. Was this for him some element of keeping to a path in his nightmare journey through a forest where the black dog pounced without warning? Affability and tranquillity pervaded the shop. A mug of tea steamed on the counter. Few would have recognised this figure, taking down some article from a shelf, as a former Test match opener, possessor of the record, in 1935, for the fastest century on debut, scorer of 50 first class centuries and over 23,000 runs. Young cricketers at Millfield, biding their time during the long, long winter terms when there was only the occasional foray to the primitive indoor nets beneath a stand at the Taunton ground, would pop in from time to time to top themselves up from Harold’s deep reserves of warmth, fellowship and understanding. Why he sat there painting by numbers was never questioned. He was their mainstay against winter, against lost form, against authority, against ‘them’ – by which both boys and Harold meant the administrators and, for him, those selectors who had neither understood nor accepted nor accommodated his genius as a batsman and who had done him down. 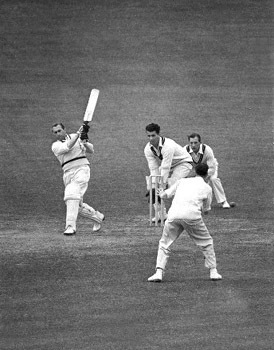 As Harold told it, he was dropped from Test cricket for hitting a six before lunch on the first day of a Test. “We don’t do that sort of thing, Gimblett.” Fancy telling that to Marcus Trethscothic! Or Sehwag! Harold had an England sweater, but the crown and lions were embroidered in black. “They” had refused to give him a new one when his was lost. He’d taken a plain sweater and a black and white photograph of the crest to a seamstress who had therefore used black thread instead of blue in the design. The sweater was a repeated reminder, a symbol of the self-perpetuating persecution by indignity that he dwelt on each time he put it on. 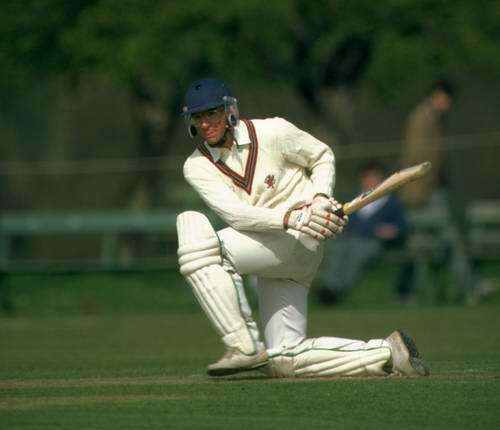 Peter, who was brought into the 1st XI squad in his first year, would have found Harold supervising one of the nets. Into Harold’s care, by their own choice, went those struggling for form. He rarely watched matches. The boys never questioned his absence. They were too busy timing the pants off the ball through extra cover across the fast outfield towards the Tor, or off their legs into the tree that then stood partially within the boundary. On rare and important matches he would be persuaded (with what inducement the boys did not question) to umpire. Ken Palmer and Harold would take the field, their white coats long and flapping over brown polished shoes. Once, Colin Atkinson, persuaded him to turn out in some mid-week affair, perhaps to celebrate the hundredth anniversary of a local club or in a cricket week. A boy or two joining them would have the thrill of seeing from up close Harold bat. No wonder he thought every cricket shot was well timed: his were. Effortlessly the ball purred from his bat and he could not help but smile and waddle self-consciously to tap down a spot disturbed by the ball. Even in the tunnel-without-end-or-light that purring sound reached something within him and gave him a moment of relief from his struggle. Perhaps it was these moments of ability, of ease, of consummate control, of light, that made the long periods of darkness the more difficult to bear. Harold and his wife regularly visited the Great House and parked their caravan in a quiet spot in the grounds from where they would stroll around the boundary while a match took place greeted by admirers on whom his smile beamed, his jokey way protecting strangers from his inner anguish. Then he came no more. Proclaiming what is true does not often make the broadcaster popular. The Squire and Third Man knew Peter, boy and man. 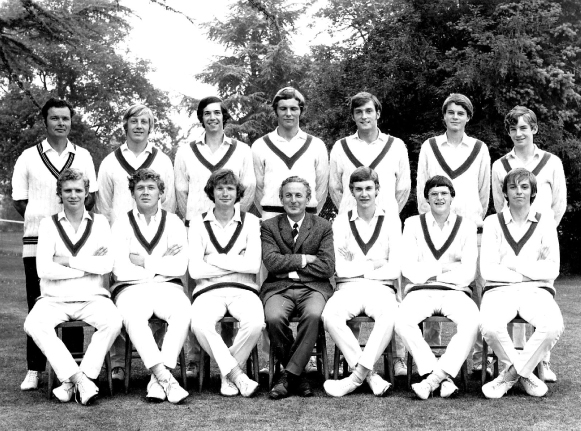 He was one of a talented and unbeaten Millfield side that came to the Great House in the summer of 1970 at the end of a school season in which they had trounced the Oxford Authentics, come off best in two-day draws with both the Welsh and English Schools XIs and very nearly beaten the visiting West Indies Schoolboys in one of the great school matches ever played. The side contained five who would soon be playing first class cricket, four of whom were to win Nat West Final medals and the other of whom was also capped for Wales at rugby. Another of the team was an England hockey international, another a tennis professional, others played for county second teams and minor counties. This side might be rated as highly as Altham’s Repton, but in Sometimes I Forgot to Laugh, Peter described them as ‘dreamers unable to pass 30, smokers, drinkers …’ Not for Peter the schoolboy camaraderie with its loyalty, self congratulation and complacency – just searing uncomfortable truth. Although published in 2004, these lines were written much earlier in 1985 or so when he was captain of Somerset and embroiled in another and more public trial of truth. The great Viv Richards and Joel Garner had helped turn Somerset into an awesome county contingent, but the grind of championship cricket and the low-key early rounds of three knockout competitions had taken their toll on these two and the other celebrity in their midsts, the instinctively divisive Ian Botham. The truth as Peter saw it was that these three were only mentally ‘turning up’ for a handful of matches a season – the semis and the finals. If the team were to build on its success, and its young talent flourish, Viv and Joel would have to go and if they went it was certain Botham would leave too. The resulting battle split the dressing room, split the Committee, split the County and split the followers of cricket throughout the land. Another would hesitate, but for Peter, it had to be done. There was nothing to put on the positive side of his cold cost-benefit analysis. This quality, characteristic or condition (depending on the reader’s point of view) made him a Liberal of conviction. His later writings and actions exposed prejudice, defied dictatorship, challenged convention, attacked arbitrary power, raged against injustice and were consistently intolerant of complacency in any shape or form. Lovers of the highest qualities that cricket can evince will hope that he will be proved right for example over Ponting and the Ponting Approach. 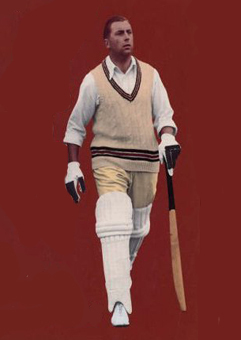 It is not about winning at all cost, it is about playing the game as human beings – that is, yes, competitively, individualistically, fiercely, but it is also about playing it socially, not in the sense of a distinction between social and professional cricket, but in the sense that human beings are social animals and cricket is not war. As with a chivalric code, cricket must celebrate underlying virtues, express respect, enlist empathy and uphold the fundamental equality of human beings. Within a primate group there will be loners and misfits and aberrants and solitaries and deviants, but paradoxically they are still part of the group. However isolated they may become, they are valuable to the group that they shun and never entirely self-sufficient from those that they distance themselves from. This produces a tension within the group, within themselves and within others that can lead ultimately to their destruction, sometimes at another’s hand and sometimes at their own. It was his inability to live his personal life by the tenets he held high – the abuse of power and trust that was inexcusable and his lack of control – that will have tormented him. He will not have cared so much about social shame as personal shame. The tragic flaw repeatedly manifests itself at school, in the club, in life. It undermines, devastates, tears down but always leaves its trace. The controversy that therefore always attended Peter is at an end, his campaigns will die as memory dies, but his writings will endure so long as people read about the game of cricket. He gave lessons and was a lesson. Is 80 the new 90 ? Are we seeing the Asification or possibly the McGrathization of Test bowling? In analysing the factors that he thinks led to the ‘boring draw’ at Brisbane, here, Peter Roebuck, moves on from considering the effect of the pace of the Gabba pitch – ‘the slowest seen in 25years’ – to examine a view attributed to the ‘Ancients’ looking on from the boundary that ‘the standard of bowling in Test cricket has fallen to its lowest level in living memory’. So, the team that Roebuck waspishly if accurately describes as ‘bearing the name England’ has disciplined itself to leave such temptations alone. He then explains that Australia, ‘from Watson onwards’, knowing that England was relying on four bowlers, set out to wear them down. Turgid stuff, as the slow runs per over rates for all but Finn substantiate. But are the Ancients right about the quality? There are some poor bowlers, but maybe they are missing how good the better ones really are. The things that surprised Third Man about the English bowling at Brisbane and today in Adelaide were the length of the run-ups now employed by Anderson, Broad and Finn, and the speeds that they are bowling at. The approaches may be carefully designed to preserve energy and optimize performance through a long hot day. They may also be the best at guaranteeing balance in the delivery. 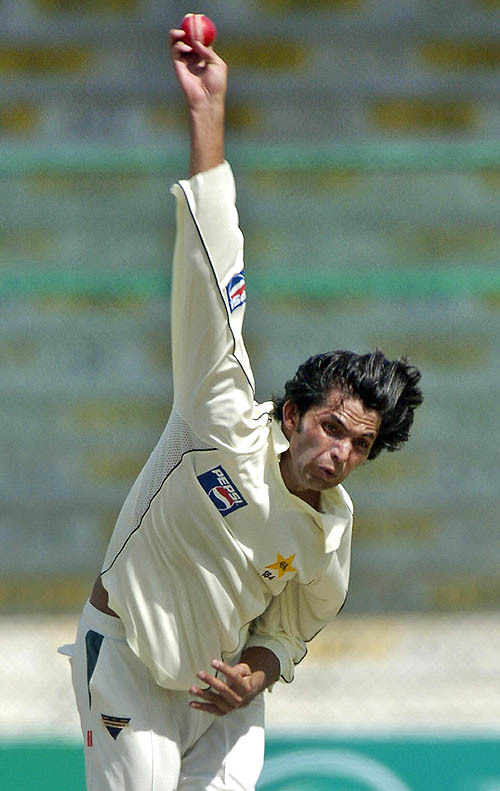 The speed of the bowling they permit may also be optimal for swing – that is for the very late swing that brings just sufficient movement immediately prior to pitching that produces the sideways movement that can ruin a batsman’s calculation of the contact point by precisely the width of half a bat. It was not so long ago that the accepted wisdom was that Tests were won by 90mph bowlers with the ability to get the ball to ‘reverse’ as soon as possible, producing dramatic late swing. We may therefore be seeing a significant and deliberate change in bowling tactics as a reaction to developments in batting and not a durth of Test class bowlers. What have been the average speeds of England’s opening bowlers on Day One at Adelaide? 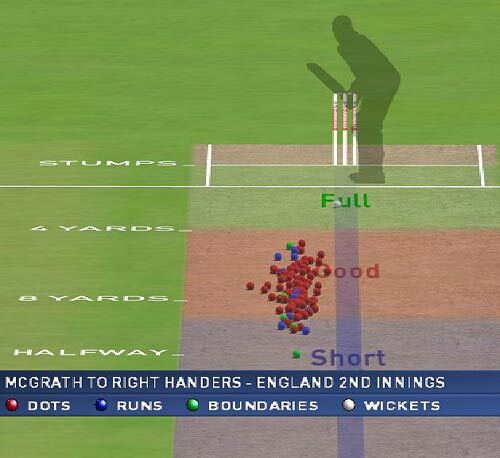 Unscientifically, Third Man would guess 82mph for Anderson and 84 for Broad. At Brisbane, Siddle bowled at a similar pace. Hilfenhaus somewhat slower. And Johnson for whatever reason not much quicker. It was only in the final over of today’s play that Sky’s radar came up red for a 90 mph delivery from Harris. All this does not undermine the points made by Roebuck – they could add further explanation -but it does challenge the view of the ‘Ancients’. Let’s face it, those same old buffers were the last to understand the recent change in spin bowling tactics. They could be wrong about what bowlers are trying to do these days. Have these bowlers and their coaches registered the impact of Asif – who did well in Australia as well as in England – and altered the model they use? Were Ponting and Clark dismissed by very high quality balls that would have embarrassed many an old time batsman? Have the bowlers had a long look at Glenn McGrath and Asif and said, ‘We should do that’? Two of Third Man’s favourite books are It never rains … A Cricketer’s Lot by Peter Roebuck and On and Off the Field by Ed Smith. Both are diaries of a cricket season written by young professionals battling with their demons and insecurities in the perenial search for form. The first describes the 1983 season, the second that of 2003. As pre-season continues Roebuck appears to be the only person in the club to use the machine – one can imagine the views of the other professionals, which include I.T. Botham, both on the use of the machine itself and on the eccentricity shown by Roebuck in using it at all. His fortunes conclude with a charity night match in Northumberland. He bats brilliantly (according to the local newspaper) to the astonishment of his team-mates. He hits straight sixes, backs away to play some delicate late cuts and steps inside a left-arm spinner to lift him over cover. He reflects that he’d never even tried to bat like this before, never even given himself the chance to play these shots. In Roebuck’s autobiography, Sometimes I Forgot to Laugh, his father described his son as ‘obscure and oblique’. Certainly no batsman’s stance ever expressed so vividly the internal contortions of a batsman’s psyche. Now this mind, clear and direct from the media centre, helps to disentangle our thinking on the game in The Age and the Sydney Morning Herald. This is a must read for cricketers wishing to escape their demons and find the Northumberland-charity-night-match within them. And essential reading for Directors of Cricket, selectors and coaches who should create the environment in which young cricketers can play without fear. It never rains … looks to be out of print but can be purchased at Abebooks for 65p plus postage at a number of booksellers. Tomorrow TM hopes to borrow the Wellsian time contraption to visit 2003.